Co. Tyrone: Bomackatall, Castlederg, Castle Gore, Clare, Corgary, Dooish, West Drumquin, Killen, Killeter, Lisnacloon, Listymore, Magheracreggan, Tully, Tullycar. The Board also included 3 ex-officio Guardians, making a total of 17. The Guardians met each week on Friday. The population falling within the Union at the 1831 census had been 69,137 with divisions ranging in size from Killylough (population 1,770) to Castlederg itself (7,954). The new Castlederg Union workhouse was erected on a 3.5-acre site at the north-east of Castlederg. The land was donated by the first Chairman of the Guardians, Sir Robert Ferguson. Designed by the Poor Law Commissioners' architect George Wilkinson, the building was intended to accommodate 200. Of all the workhouses in Ireland, only nearby Gortin had a capacity this small. Castlederg's construction was carried out by John Maguire of Omagh. It cost £2,100 plus £484 for fittings etc. and had the lowest construction cost of any new Irish workhouse. The workhouse was declared fit for the reception of paupers on 20th February 1841 and admitted its first inmates on 2nd March. Its location and layout are shown on the 1907 map below. The buildings lacked the single central block normally found at the front of the site. The entrance and administrative functions were split between two separate small blocks, a feature also found at Ballycastle and Dunfanaghy. The T-shaped main accommodation block had the Master's quarters at the centre, with male and female wings to each side. At the rear, a central spine containing the dining-hall, chapel, and utility rooms. A small separate T-shaped block at the rear contained the infirmary. During the famine in the mid-1840s, an extra storey was added to the infirmary to accommodate an additional 56 inmates. A 36-bed fever hospital was subsequently erected at the north of the workhouse. 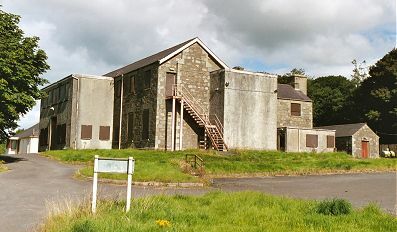 Castlederg fever hospital from the east, 2003. Because of the Union's small size, the posts of Union clerk and workhouse master were initially combined, with David Johnston being the first appointee. The posts were however subsequently separated. At the 1901 census, the population of the Union was 11,789. The workhouse closed in 1929 and lay empty before being demolished in the 1930s and replaced by the Edwards school. The fever hospital was remodelled in 1929 and became the heart of the Derg Valley Hospital, now closed. Masters: David Johnston, John S Nesbitt, William Roulston. Clerks: David Johnston, Edward Hemphill, Robert Ascott. Public Record Office of Northern Ireland, 2 Titanic Boulevard, Titanic Quarter, Belfast BT3 9HQ. Holdings include: Board of Guardians' minutes (1839-1948); Returns of Deaths (1841-1934); Combined workhouse registers and statistical records (1923-49); Indoor registers and discharge books (1947-8); etc. Official correspondence relating to the building of the Castlederg workhouse.